Can you explain one more time – slowly please – the exact purpose this technology platform is serving? I don’t know if it is just a problem with me, but I tend to either roll my eyes or shut my mind off the moment I hear these or their cousins. It is alright for an organization to exploit internal efficiencies but unfortunately the zealots who are given such powers turn up as autocratic commander-in-chiefs and completely forget that fraternity for which the company exists. Customers are not incidental to the business, no matter how tightly one would like to run the organization internally. My friend and colleague Mahesh CR takes a more encompassing (and I daresay circumspect) look at this malaise. The job of a hirer is to essentially make good to excellent guesses of posterior probabilities, almost in the same style as Bayesians. Like in Bayesians, the quality of the P(A/B) (read as “probability of event A given event B) is very dependent on how the two events are correlated in the cause-effect paradigm. In all the examples above, the relationship is very strong a-priori and that is why the tests are a damn good measure of how the incumbent will shape up in the role that is being tested for (little chance of a programer turning out to be Joel Spolsky when he can’t write a recursive string reversal algorithm in C++). For jobs where the a-priori estimation is inadequate (or non-existent) the challenge of establishing a posterior probability becomes onerous. Get a sense of his bias-for-action. I have often encountered the arm-chair product manager – plenty of theory, powerpoints, boxes-and-arrows and flailing arms – nothing at the end of the budget cycle. It is easy to spot them – they’ll have less verbs like “delivered”, “achieved”, “built” etc on their resume. Good luck with the hiring and caveat-emptor just in case you land up a disaster after all this. People still manage to game the interview process. There are different ways of telling a story. Each way has its own media associated with it. A single story can be articulated through different media with varying effects. Films provide a dynamic audio-visual experience, comic-strips only static visuals, podcasts only audio and the print media places enormous responsibility on the author of careful and detailed articulation. For the same story to be told, the content and presentation varies significantly depending on the choice of the medium of expression. Brings me to Requirements. 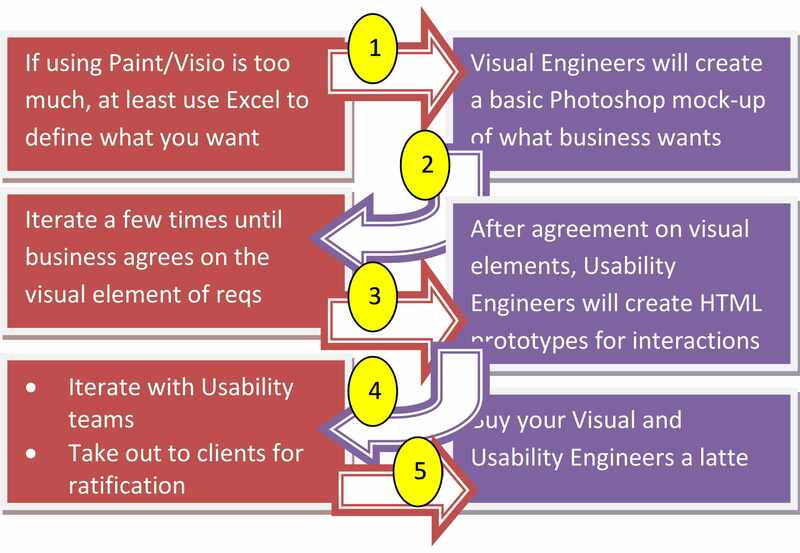 I have seen people use Word documents, Excel sheets, Visio diagrams, Powerpoints to provide requirements. Unfortunately not much thought is given while choosing one medium over another. There is no reason why a Use Case be written in Excel, or a tracability matrix crafted in Word. Many organizations create the artifact definition for Requirements but fail to mandate the medium of expression. It may sound trivial but believe me, it is not. Here is how the thought for this post got triggered. I had made my mind to write about how offshored captive units of global companies struggle to fix their reporting relationships and how this impacts the organization and the employees. It then occured to me that it will be a very different way of expression if I decided to write that post as a presentation. Here is the output (some fonts got messed up, some animations were lost). Very different from what a blog post on the same topic would have looked like. The above diagram should be self-explanatory. If your product relies on a visual impact and superior usability as core differentiators then please do not leave that job to your developers. Visual Engineers and Usability teams usually create two important artifacts – a visual representation (from 2) and a fully or quasi-clickable html mock-up (from 4). Do not throw these away. Use the HTML mock up to create an early adapter program (pre-alpha) for your product and create a feedback loop back into the Usability team. Show the clickable model to senior sales folks to excite them about what is coming up as a salable product down the road. Plug the Photoshop based static output into presentation and other non-interactive product collaterals. Start with the finished product. It is a fantastic place to begin.